The electronic switching of currents to the coils of the BLDC motor is more efficient than the mechanical switching of the DC motor. Brushless Motors: What's the Big Difference? Brushless Motors: What’s the Big Difference? Are you considering a brushless motor for your application? Are you confused by the offerings of “brushless DC motor,” “brushless servo motor,” and “brushless torque motor”? If so, then read on for an explanation of what we mean by these terms and help with choosing the right type. Brushless DC (BLDC) technology has been around in one form or another for several decades. The difference between brushed DC and brushless DC technology is (surprise!) that brushless motors do not use brushes. 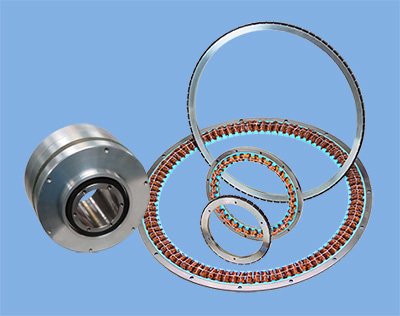 Brushes are used in DC motors in the commutation process to switch current from coil-to-coil in order to develop torque to spin the rotor and attached load. The process is mechanical in that the brushes physically slide on a commutator to effect the switching among the coils of the motor. Brushless motors, on the other hand, rely upon electronics to accomplish the commutation task. The electronic switching of currents to the coils of the BLDC motor is more efficient than the mechanical switching of the DC motor. What’s more, there is no wear over time and no replacement of brushes or commutators, and no sparking at the brush-commutator interface. As a result, brushless motors are essentially maintenance-free, generate low-EMI (electrical noise), can operate at higher voltages, are more efficient and can be made more compact than brush motors rated for similar output power. Generally, motors you find on websites and in advertisements that are referred to as Brushless DC Motors are intended primarily for general-duty commercial and industrial applications, especially for those applications where you don’t want or need to accurately control the speed of the motor or its position. All brushless DC motors require a companion drive electronics package, unless the drive is built into the motor as is the case with Allied Motion’s EnduraMax family of brushless DC motors. Application examples: Brushless DC motors are a great choice for powering pumps, fans and blowers, compressors and other similar commercial or industrial applications where long life, no maintenance, compact size and electrical efficiency are important in the design. These motors are ideal for battery-powered devices where their improved efficiency can dramatically improve battery life. Brushless Servo Motors are a specific subset of BLDC motors intended for applications where precise positioning and/or high speeds are the goals. These motors are designed for fast and accurate response in highly dynamic applications where following trajectories and positioning quickly and precisely are key criteria. Allied Motion’s brushless servo motors are available in either metric or NEMA-size housed versions, and are typically offered with optional add-ons, including optical encoders, brakes and/or gearboxes. Allied Motion also offers frameless versions, consisting of rotor-stator matched sets in our Quantum family of servo motors. Frameless brushless servo motors are ideal for situations where you want to embed the motor in your mechanics in order to achieve tight coupling to the driven component and eliminate redundant components for the most compact design possible, saving weight and reducing cost. When you have custom application requirements for motor performance outside our catalog ratings, IP-rated sealed construction, custom mounting interfaces, extreme environments with high temperatures or heavy moisture, or anything else outside the norm, Allied Motion can help. Custom designed brushless servo motors have been a specialty of ours since we began offering this type of motor. 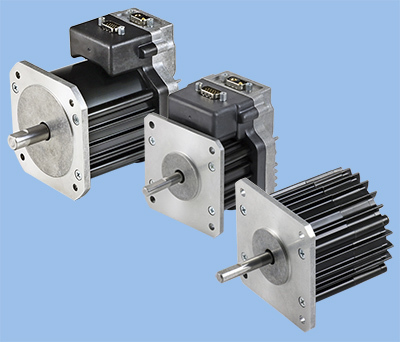 Application examples: BLDC servomotors are most effectively used in robots, pick-and-place equipment, semiconductor fabrication, test and packaging equipment, machine tool axes, and similar applications where the benefits of servo motion control are necessary to achieve the required performance. Finally, in our look at the three most common types of brushless motors today, we come to perhaps the most misunderstood one: the torque motor. All rotary motors produce torque, so it’s fair to ask why torque motors have that special designation. The reason stems from the fact that torque motors are designed first and foremost to produce a lot of torque, and do it at comparatively low speed. If you require precise positioning at low speeds, gear motors could be an option, but there are drawbacks such as component inefficiency in power transfer, added mechanical complexity, and backlash (lost motion). The better option may be a Brushless Torque Motor. Torque motors are usually embedded directly into the mechanics they are to drive, instead of coupling through intervening mechanisms like a ballscrew or gearbox. Characteristically, torque motors have more poles and are larger in diameter than other motor types. That combination enables them to produce more torque per volume and weight than traditional BLDC motors of similar volume and weight. These motors have been electromagnetically engineered to deliver the highest possible torque at relatively low speeds, with mechanical features to fasten directly to your payload for direct-drive simplicity and efficiency. In addition, the nature of their design provides a relatively large clear aperture inside diameter, which can be an advantage if you need to pass light (e.g. laser beam), wiring or plumbing through the center of the axis being driven. Moreover, they can be combined with large diameter high count encoders in order to reach arc second levels of rotary positioning precision. 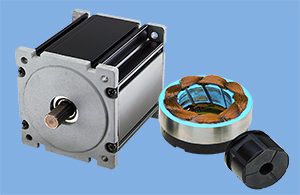 Allied Motion offers both frameless and housed brushless torque motor families. Our HT and Megaflux frameless families provide models ranging from about 5 mm in diameter all the way up to 792 mm in diameter. Allied’s largest standard torque motor is the Megaflux 760 (OD 792 mm), offering a rotor through-hole size of 582 mm (22.9 inches), and a staggering 16000 Nm of intermittent peak torque at stall. The high pole count of these units makes them well suited for delivering high torque at low speeds and achieving highly precise positioning. Application examples: These range from robotic joints to simulators to multi-axis tracking and positioning gimbals to GPS-based automated vehicle steering to movie camera operation. You can maximize performance with custom versions of torque motors that have a variety of diameters, axial heights, special mounting hardware interfaces, and special electromagnetic combinations and features to enable higher-speed operation when required. We hope that this brief overview of brushless motor types helps you have a better understanding of the distinctions among brushless DC motors, brushless servo motors and brushless torque motors. Whatever your application requirements, we’ll help guide you to the right decision that maximizes performance in your application while minimizing the size and cost of the motor and drive system you need. Give our application engineers a call at the Solution Center that serves your area, or use the contact page on our website. We can help!